Home > Heavy Duty V Belts > Moulded Notch V-Belts. AX, BX, CX, 3VX and 5VX Sections. > AX Series. 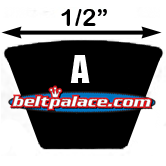 1/2" Wide Molded Notch V-Belts > AX56 Tri-Power Molded Notch V-Belts: AX Series > A56 Industrial V-Belt. 58" (1473mm) Length. 1/2" (13mm) Wide. 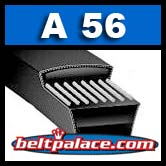 A56 Industrial V-Belt. 58" (1473mm) Length. 1/2" (13mm) Wide. A56 Industrial V-Belt. 58" (1473mm) Length. 1/2" (13mm) Wide. "A" Section Industrial V-Belt. Meets RMA oil and heat resistant standards. Meets RMA static conductivity requirements. Suitable for all industrial applications, including v-flat drives.